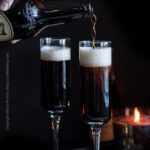 The Black Velvet cocktail is a luxurious two ingredient mixed beer drink. 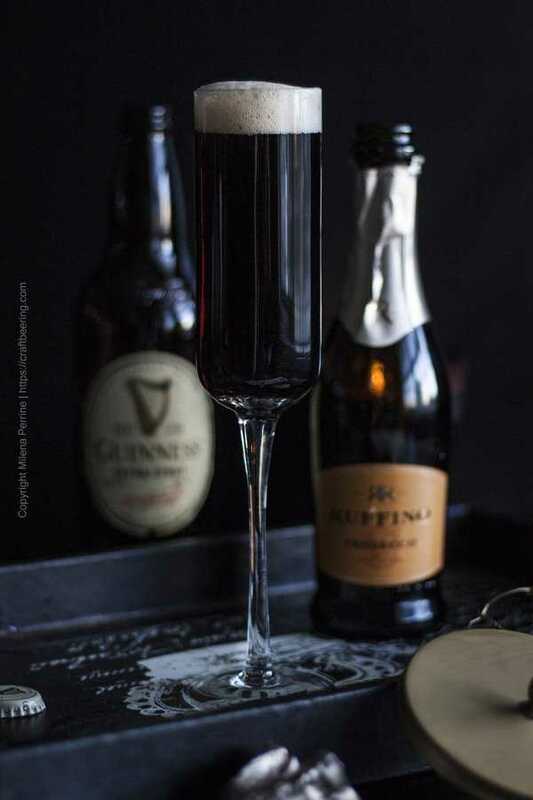 It consists of stout and champagne and is one of the most famous beer cocktails in the world. 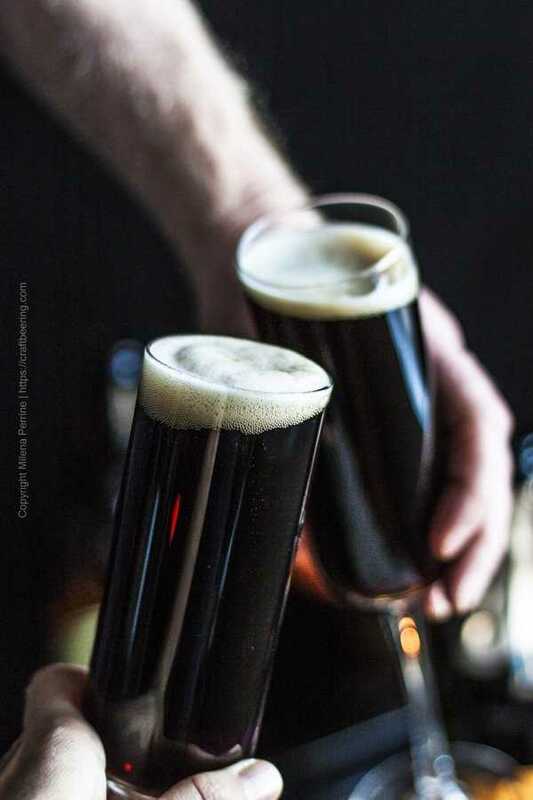 If someone told you that the idea of combining stout with sparkling wine is not a good one – feel free to ignore them until you taste the libation for yourself. What is a Black Velvet Cocktail? You don’t have to break the bank and use Champagne – any dry sparkling white wine will work. Prosecco is a favored alternative. Most commonly Guinness Extra Stout is mixed but any strong stout can be used. How To Mix a Black Velvet? Opinions vary as to whether the Champagne or the stout should be poured first. Some say that because of the origins of the cocktail (see Historical Background notes below) stout is being added to Champagne, therefore the Champagne should go first, followed by the stout. Others insist that the stout must be poured first and the Champagne floated on top. This is tied to the notion of a layered look. In the end – it really doesn’t matter, because if the two Black Velvet ingredients do not mix during pouring, mixing with a cocktail stirrer is encouraged to achieve the landmark dark color. Besides, the drink tastes exactly the same regardless of the order the ingredients are poured. Start by pouring dry sparkling wine into a flute or a similar tall and skinny glass. Wait a couple of seconds for the vigorous bubbling to settle and be sure the glass is just under half full (to budget for the stout and its own foam). 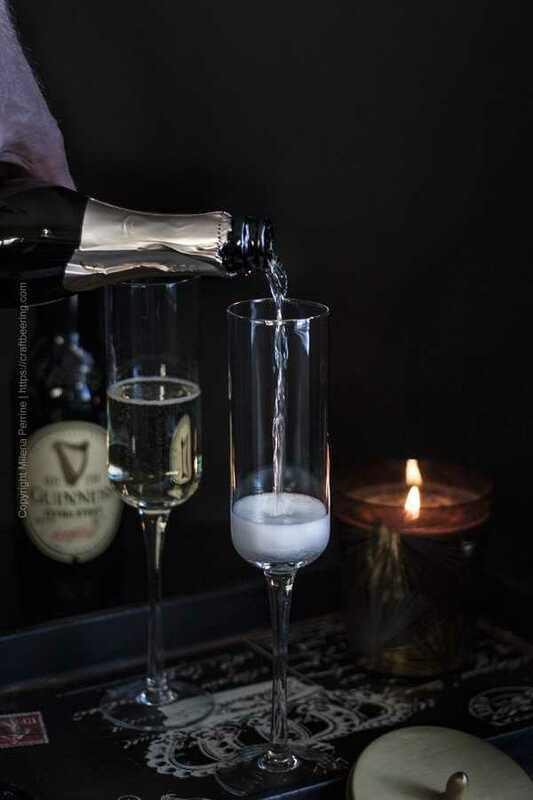 Pause or completely stop as the liquid level reaches the top of the glass to allow for some of the foam to dissipate and then gently top it off. 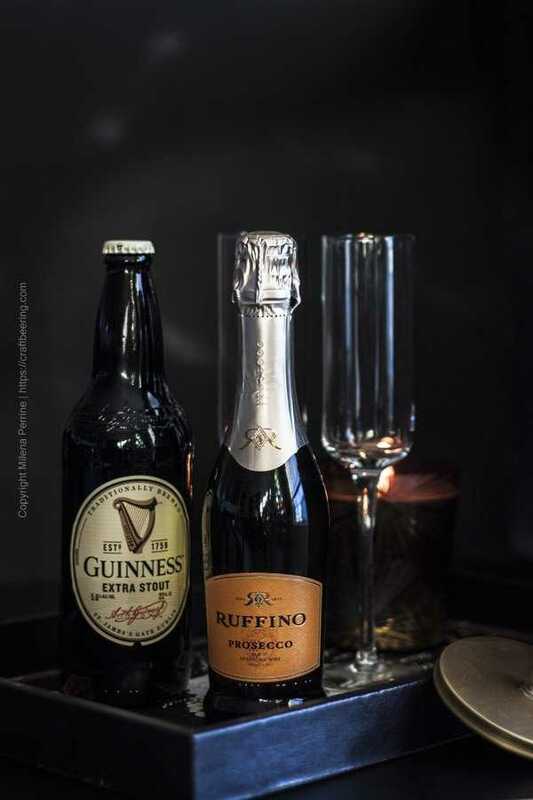 The stout is instantaneously blended with the sparkling wine during pouring, no layering occurs and no stirring is required. What Does a Black Velvet cocktail taste like? The resulting blend is like fruit covered in dark chocolate on the nose. It has a moderately creamy mouthfeel as the crispness of the sparkling wine very elegantly cuts through the robustness of the stout. It is rich, yet sprightly with a wonderful lively, non-abrasive carbonation. There are alternating zings of controlled tart fruitiness and calming ripples of caramel sweetness. Which comes first I cannot tell you, but it is most certainly a memorable blend. Gorgeous mahogany hues underlay the black color of the cocktail. I used a candle flame to showcase them in the picture for this post and highly recommend that you enjoy a Black Velvet by candlelight once. It doesn’t have to be a romantic experience, it is just that the visual element enhances the overall satisfaction of drinking the cocktail. When to Drink Black Velvet? It is truly a year-round pleasure source. It feels refreshing on a warm summer evening and warming on a winter’s night, especially by the fire place before dinner. Do Men Drink Black Velvet? Yes. Absolutely. In a sense the cocktail is a variation of the Black and Tan drink, where pale ale and stout are layered and the shandy (ale and juice mixed together like in this IPA Grapefruit Shandy). The official origins of the cocktail are traced back to December 1861, the year of the death of the British Prince Consort Albert – the late husband of Queen Victoria. The Queen was so deeply affected by his death that she wore black for the rest of her life and mourned him deeply. 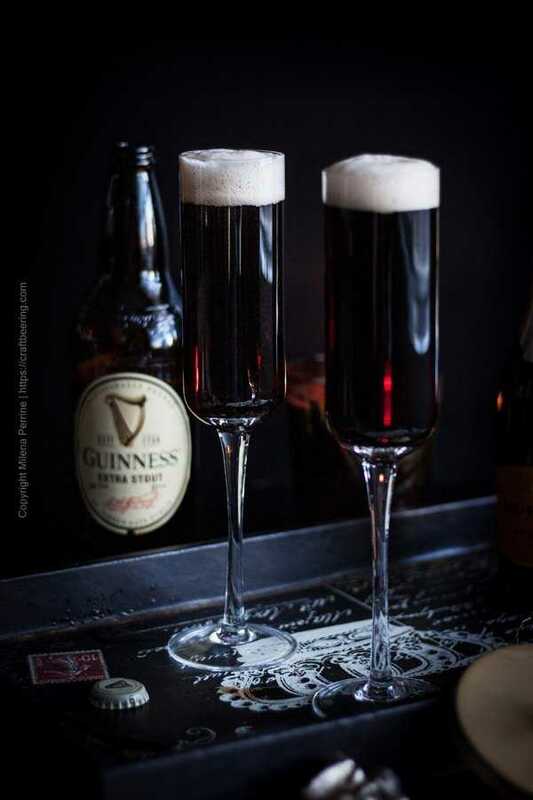 Following the funeral ceremony the mood reflected the dark, sorrowful state the Queen was in and a bartender at the Brooks’s Club in London decided that the Champagne should be in mourning too and added stout to it to color it black. The drink became so popular in the ensuing years that there are records of recipe cards advising how whole pitchers should be mixed to achieve the black and smooth mixture known as Black Velvet. Pitchers and glasses were to be very well chilled and two bottles of stout added to every bottle of Champagne. 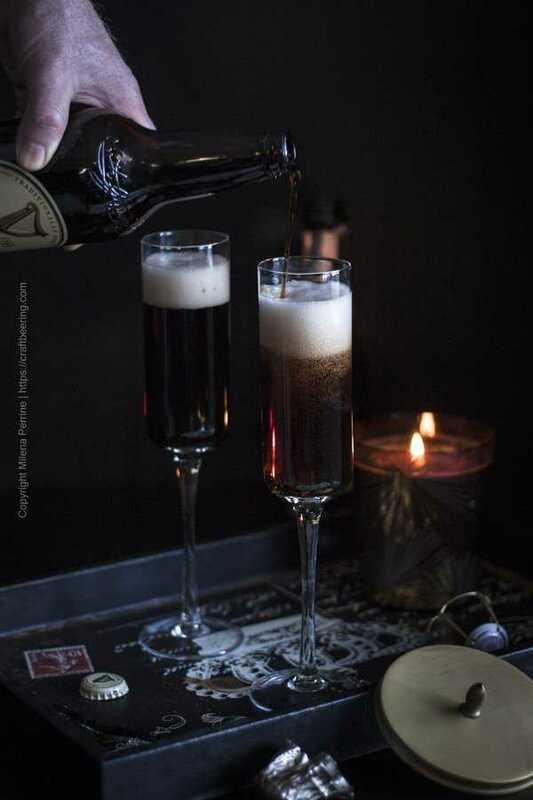 Black Velvet cocktail is a darkly smooth blend of Champagne and stout. Fill a flute or other tall, skinny glass halfway with Champagne. Top with stout. Alternatively, fill the glass halfway with stout, then gently pour the Champagne over the back of a spoon to achieve a layered look. Stir to mix prior to enjoying. A 1:1 ratio of the two ingredients is standard. Be sure to chill glasses and ingredients before mixing. 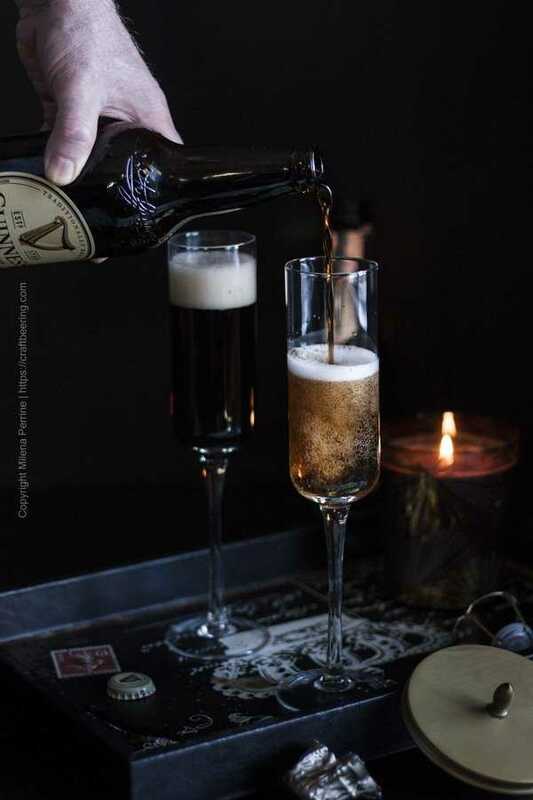 If you do want a layered look to your Black Velvet and feel an attachment to the argument that the sparkling wine should be floated on top of the stout, use the back of a spoon to gently pour the sparkling wine over a half-filled with stout glass. Enjoy the cocktail at brunch – even though it is a tad bit stronger than a mimosa it pairs well with a variety of pastries – from fruit centered to chocolate dominated. Always so much to learn form you! Never heard of this, but surely we would love it, especially by candlelight! So cool and such great photos! I’ve never heard of such a cocktail but would definitely love to try…after all, ’tis the season 😉 And the name sounds so lovely too. I can see why it’s called ‘black velvet’ – the stout must make is so creamy. Cheers! Yes! Favorite season when cocktails are almost necessary every evening, right? I love beer cocktails! And I love Prosecco! Yet I’ve never had one of these! Cannot wait! Cheers! Having a family like yours sounds fabulous:) Cheers, Kelsie!